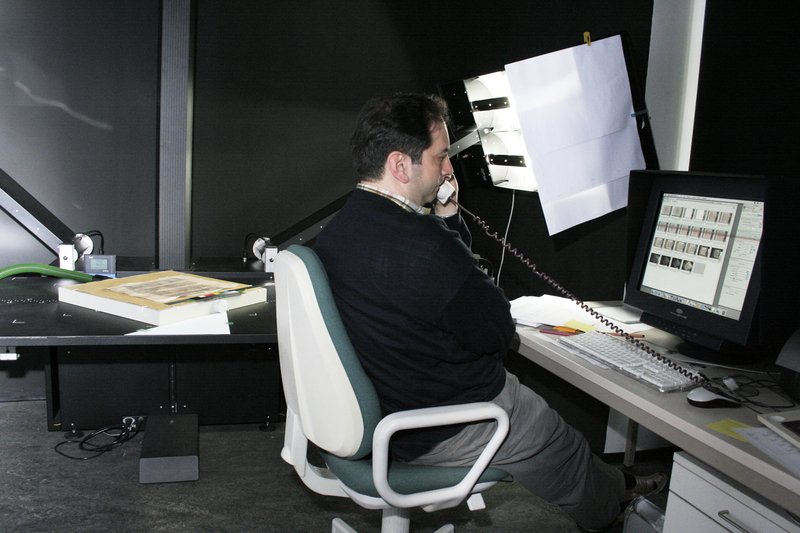 Zeki Mustafa Dogan testing the raking light imaging and suction apparatus in Leipzig. The Codex Sinaiticus Project's Website Working Party set out the preliminary framework in 2006 and commissioned a Technical Sub-group with drafting the technical specifications for the website. The website had to bring together datasets (digital images of the leaves of Codex Sinaiticus, XML files for the transcription, Excel spreadsheets for the physical description, XML files for translations, etc. ), which had been created at different venues, by different people and according to a variety of standards, and integrate them into one unified user interface. In the long-term, the website will be hosted and maintained by the British Library. The website therefore needed to conform to technologies and standards supported by the Library's IT infrastructure. The website had to link image and text representations of the pages of Codex Sinaiticus in a way never before implemented in an online edition of a manuscript. In June 2007, Leipzig University Library put the development of the website out to tender, based on the guidelines set out in the technical specification. The tender was awarded to ACS Solutions, a firm specialising in IT services and based in Leipzig, who collaborated with the Berlin communication agency 3-point concepts. The development of the website was co-ordinated by Zeki Mustafa Dogan at Leipzig University Library and was supported by Leipzig University's IT Department, who also hosted the site.